Scholarship funds utilised to launch the book “Ajò in Australia – Let’s go to Australia”, documenting the results of the research conducted by Saberio Minutolo into Sardinian immigration in Victoria and the history of the Sardinian Cultural Association, held at the Italian Immigration Museum @ COASIT. The book has been written by Pino Bosi, published by Grollo-Ruzzene Foundation via the Italian Australia Institute at La Trobe University with the support of the Autonomous Region of Sardinia and launched by Aldo Aledda, Sardinian Historian in Melbourne for this special occasion. For writing the yet to be named book based on the research into the history of Sardinian immigration in Victoria, including a general prelude on the surrounding circumstances, individual family stories, including the publication of such stories, as well as the history of the Sardinian Cultural Association. For his extensive research into Sardinian Immigration in Victoria, including the documentation of individual personal stories as well as the history of the Sardinian Cultural Association. 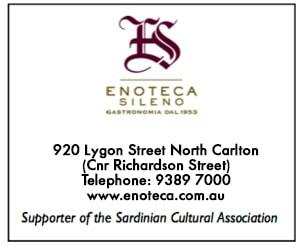 Funds utilised to launch the Project aimed at researching Sardinian immigration in Victoria and the history of the Sardinian Cultural Association, held in the "Galli Room" of the Assisi Centre in collabration with the Italian Australian Institute and the Italian Consul General of Melbourne, of which the results will be released in the form of a contemporary book.